Grooming and personal hygiene are part of our everyday activities. Step by Step In Home Care LLC knows that looking great starts within so the daily bath and the regular shaving cannot be taken out from your routines. 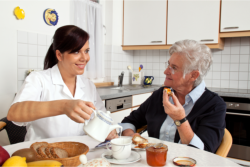 Step by Step In Home Care LLC can provide you with home care staff who can prepare your meals at home. Our caregivers understand how important it is for the client to maintain a balanced diet and to eat on time. Many of the clients we care for have medications to take with meals so it’s important that that is given consideration in planning meal times as well. Your assigned caregiver from Step by Step In Home Care LLC will remind you to take your meds on time – whether during meals, or in the middle of the day at certain hours prescribed by your doctor. Taking your medications and complying with the medication therapy plan is critical in preserving your health. We will do all that we can to efficiently remind you when your medications need to be taken. In addition to that, we can also remind you or your loved one when your meds supply needs a refill so you can ask your doctor for a prescription and have it filled by your pharmacist. We understand the concerns that arise when dealing with the care of aging loved ones , post op patients , pediactrics , injuries . Caring for a mother with Alzheimer’s, a father who has trouble performing everyday activities, or a grandparent who needs regular attention can be stressful and often overwhelming. Step by Step In-Home Care offers a variety of home health care services that fit your family’s specific needs. Whether your loved ones require personal care and daily hygiene assistance, light housekeeping services, transportation, or simply companionship, the highly-experienced and compassionate staff at Step by Step In-Home Care is ready to assist. Our staff is trained and qualified to provide excellent care, recuperative care after surgery, injury, or illness. Our service area includes Calvert County, Anne Arundel County, Charles County, and St. Mary’s County. All other counties in Maryland.